Today, a friend sent me this article, "Karl Lagerfeld's 13 Craziest Quotes" from the Daily Beast highlighting some of his most ridiculous quotes from a new book titled, "The World According to Karl." . I'd suggest checking out the article, but keep in mind that Karl Lagerfeld is known for saying outlandish things and that I thought they were pretty ridiculous, thus remember this when reading. While he may say crazy things (he often swears he is kidding), he is very well known in Fashion. He is the head designer at Chanel and has held previous posts at Fendi as well as having his own fashion line. 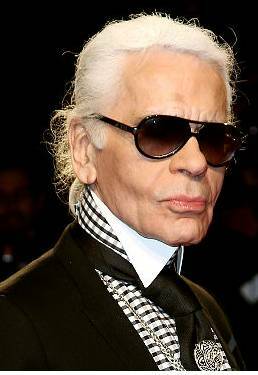 Mr. Lagerfeld may not be good on social graces, but he definitely knows his way around fashion and design.